I was remiss, and I apologize. 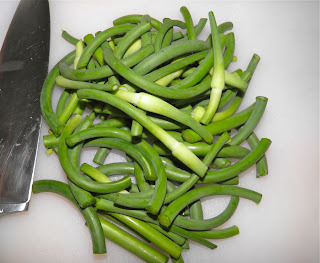 In my last post I used garlic scapes without any explanation as to what they were or how they taste. I will rectify that in this post. Garlic scapes only arrive for a short stay in the grocery vegetable department in summer, so one has to be prepared and look for them. In fact, beautiful garlic scapes are for sale at Pete’s Frootique in Halifax as I type this post. Chop the scapes into manageable, bite sized pieces. What is a garlic scape you ask? 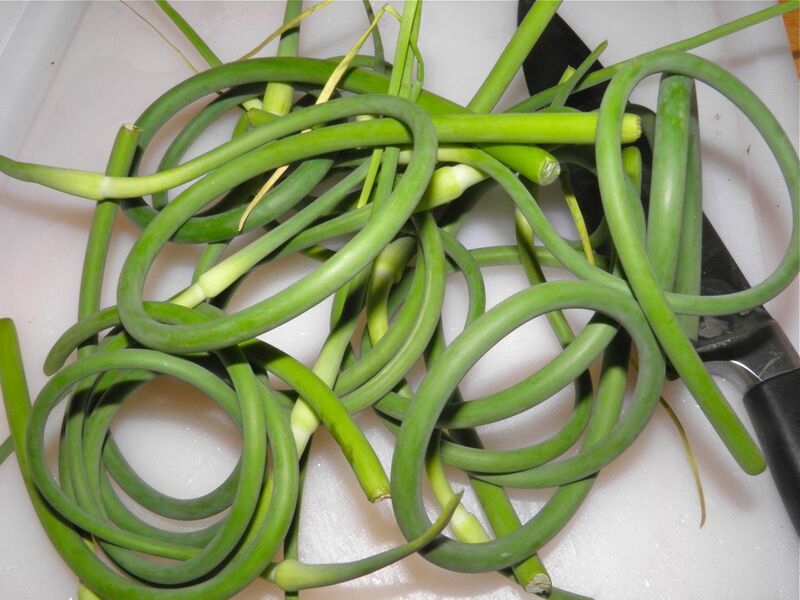 Scapes are the flower stalks of any member of the Allium family which includes onions, leeks, chives, and garlic. 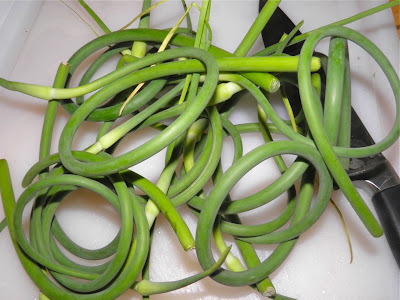 Garlic scapes, from only the hard neck garlic variety, curl as they grow, then straighten out and grow little seed-like bulbs. When the garlic scapes are still curled is the best time to eat them. They’re an extremely under utilized and delicious part of garlic. Most people only use the bulbs and throw away the tops. That’s a complete waste. Other parts of the garlic plant are also edible, such as the leaves and flowers. Scapes, leaves and flowers are all milder in flavour than the actual bulbs. Since they're part of the garlic plant, they offer the same health benefits as garlic cloves. These include help in the prevention of heart disease, high cholesterol, high blood pressure, and cancer. Scapes are also thought to boost your immune system and reduce inflammation. The immature flower stalks (the “scapes”) are used in a multitude of cuisines world wide. They are common additions to the food of many European, Asian and Pacific cultures. The mild garlic flavour is a wonderful additions to stew, roasts, marinades, salads, sandwiches, sauces, pasta, pesto, stir fries and more. 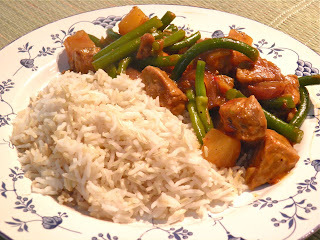 I went “Pacific” with the following recipe. Heat the oil in a large skillet. 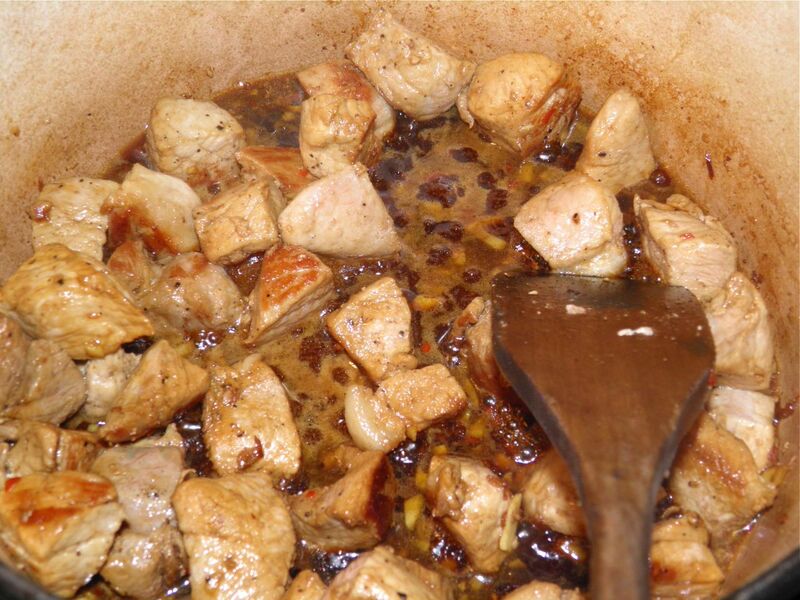 Add the cubed pork, sprinkle with black pepper and cook until browned. Add the soy, ginger, chilli, vinegar, and brown sugar. Cover and simmer for about 20 minutes. Add the chopped tomatoes, onion and pineapple with its juice. Bring to a boil, reduce heat to medium, and cook uncovered for 10 minutes longer. Make sure the meat is submerged in the liquid as much as you can. Add the garlic scapes and cook until they are just still crisp, about 5 minutes. Add the mixed cornstarch and stir until the sauce is thickened.